6 Reasons Why You Should Start A Business Blog Today! In our previous blogs we focused on how to write your blogs, how to make your website search engine optimized (SEO), how to get online success and how to map and reach your target audience. Today we’re not focusing on the how, but on the why! Why should your business use a blog to communicate with their target audience? Why is a business blog such an important and successful part of your professional communication? 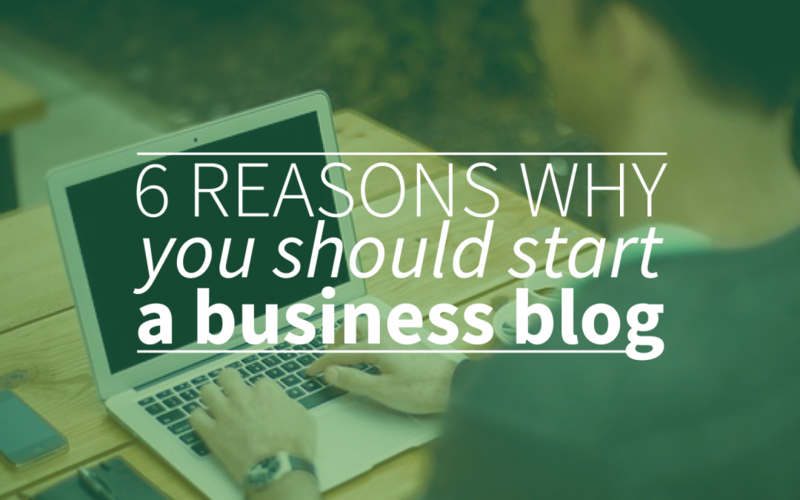 We’ll give you six reasons why you should start your own business blog today. When you’re blogging about your area of expertise, you’re sharing your knowledge. When you’re writing high value content for a while, this will make people see you as an authority in a specific branch. When they’re looking for information about that subject, you’re like their teacher. After you’ve gathered their trust, they might see you as their opinion leader and this supports their confidence in the services and product your business provides. By publishing on your business blog on a regular basis, you’ll increase your position in the search engines. Google appreciates websites that frequently post new and valuable content. And a higher position in Google means more traffic. If you’re article is interesting and relevant for your target audience, they might even share it on Facebook of Twitter. Besides this can also result in more leads like subscriptions to your newsletter and maybe even appointments with future customers. Even more reasons why you should start a blog right away! How often do you lack content to share with your followers on Facebook or Twitter? Your business blog can be a handy tool to strengthen your social media presence. By promoting your articles on the social media channels, you always have something to share. Besides you’ll make people aware of your existence and your target audience will get easy access to your content. Social media will also increase the shareability of your content, which can lead to a bigger online network and more traffic to your website. And traffic to your website is of course the first step to online success! A business blog generates is not a monologue, it’s a dialogue. It’s a easy way to interact with your potential customers and if you keep an eye on the responses of your target audience, you’ll get to know the people that you’re dealing with. This could help you to develop a stronger relationship with your future customers. You’ll learn what your target audience likes and doesn’t like, what they’re interested in. This information is valuable to determine the developments of your business and to improve your services or products. This could mean that your efforts that you put in your blog right now, give you positive results and more traffic for a long time from now. By reposting on social media and linking to old articles, you can keep them alive as long as the information is valuable. Besides if you write a search optimized article (SEO) it can be on the first page of Google results even after years. So, why should you start your business blog today? A base of trust in your services and products, by becoming an opinion leader for your target audience. An increase of traffic to your blog, which can lead to more leads and interaction with your customers. A more likely chance to enjoy a positive return on investment. A better relationship with your target audience. You’ll get to know your their wishes and irritations and will improve your products and services based on that. A stronger social media presence, because of the sharability of blogs. Long-term results, as long as your content is still valuable, you can recycle it again and again. And finally, online success! So why not start your business blog today?! Don’t forget to start your free trial of webtexttool also, to make a quick start in the search engines!